As business owners, our priority is to help people by offering them products and services that improves their lives. And we can only do that by reaching out effectively to the specific audience that needs our help. Video is hands down the most effective way to cut through the clutter and setting up a strategic Facebook video ad campaign is the only way to you can control exactly who sees your video and when they see them. 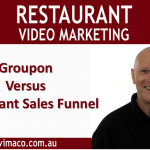 There are only three types of video ad campaigns that you need for your business. That’s right – only three. And when you run these continuously, you will develop consistent stream of new leads and customers. In your first Video Ad Campaign, you’re going to use your Brand Video to introduce yourself to a new / cold audience. Typically it’s a short video. Think of it as you would if you were introducing yourself to someone at a social event. You put your best foot forward and let them know what you do to help people to solve a specific problem. For example instead of saying you are a bricklayer that makes fences, you could you say that you build solid fencing that help families feel secure while adding more value to their home. It’s vital that you don’t talk about yourself, or about your products or services as you’re not trying to sell anything at this stage. Focus instead on the end result for your customer. Remember, you’re not selling drills, your offering a hole in the wall so that they can hang up their painting. Your audience is only interested in the solution you provide. This video provides your audience with valuable content and continues to build a relationship with them. You want to place this video on your website and drive your traffic to watch it. Now give them your best stuff and position yourself as an expert in your niche. Your third ad campaign is your Call to Action Video . This time you retarget those that visited your website and take the relationship to the next step by presenting your specific offer for them. It might be a free Lead magnet to grow your email list, register for your webinar, or it might be to buy a product. This system is what I call the TLC Formula – Traffic Leads and Customers. It’s simple in concept, but not necessarily easy to implement and that’s why I’ve created a free PDF Guide “How to Create a Profitable Facebook Video Ad System to Get you More Leads and Sales” and you can download by clicking the link below. I’d love to get your feedback so let me know what you think of it. And feel free share this video to your friends and colleagues.